What are the most effective specific phobia treatments? A specific phobia can negatively affect someone’s life severely. Living in fear for a possible encounter with the phobic animal, object or situation is exhausting and limiting in several ways, such as missing out on a promotion at work due to speech anxiety (Glossophobia) or a lovely trip with friend due to a fear of flying (Aviophobia). Although avoiding the phobic animal, object or situation decreases anxiety and stress temporarily, it increases phobic anxiety and stress in the long run. There are several types of specific phobia treatment, but not all of them are effective. One type of specific phobia treatment involves exposing oneself to the phobic animal, situation or object, whereas another type of phobia treatment mainly focuses on relaxation . Most people with a specific phobia do not reach out to a therapist or counselor, because they think their phobia is untreatable, think there are no effective treatments for phobias or because they have to expose themselves to the phobic animal, situation or object . 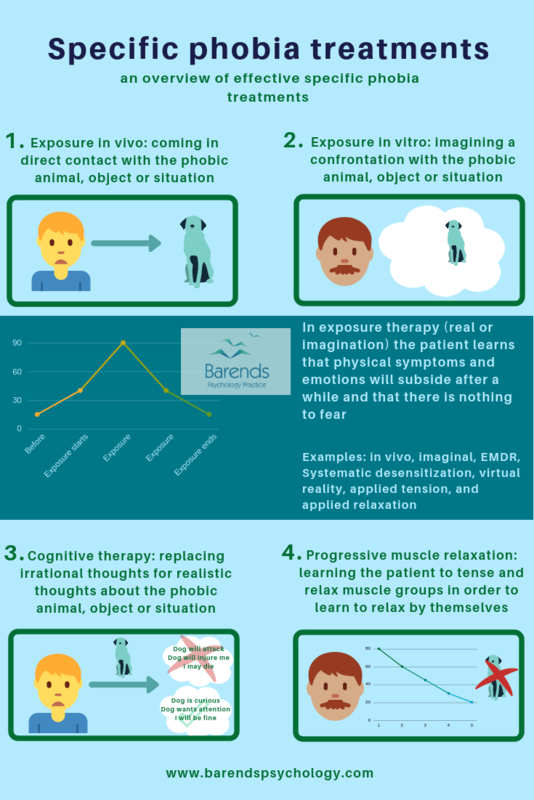 This page discusses which specific phobia treatment is effective, what they entail, and how effective they are compared to other treatment options. Exposing oneself to a phobic animal, object or situation is something someone with a specific phobia does not want to do at all. Being confronted with the phobic object, animal or situation causes physical symptoms, such as shaking, racing heart, feeling light in the head, and unpleasant emotions and feelings, such as fear, terror, and fright. The most common response to an encounter with the fearful animal, object or situation is to go away, because this immediately calms someone down. It is this type of behaviour that creates a false belief in people that says that staying away from the phobic animal, object or situation reduces anxiety and stress levels. 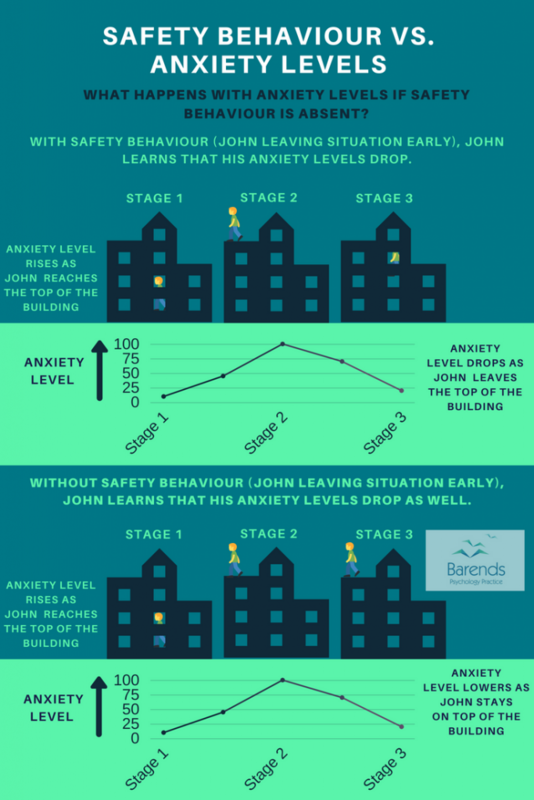 As shown in the image above or on the right side, anxiety and stress levels do not only subside or disappear when leaving the situation, they also subside or disappear when someone stays in the situations and waits. The time someone needs to stay in that situation is different for everyone; for some people it takes 10 minutes to calm down, whereas for others it may take up to 30 minutes. In the end everyone will calm down, because emotions, feelings, and physical sensations are always temporary. When someone is calmed down, it is easier to adjust certain irrational or dysfunctional beliefs about the phobic situation, animal or object. Exposure in vivo uses the above mentioned strategy: by staying in the situation with the phobic animal or object long enough, someone will experience that their physical symptoms, emotions, and feelings will subside. At the same time, they will see that their biggest fear (for instance, dying or being attacked) does not come true, and consequently can adjust some of their beliefs . Exposure in vivo is considered the most effective specific phobia treatment option in the short run and is together with imaginal exposure the most effective phobia treatment in the long run ,. Exposure in vivo has been extensively researched for fear of dogs, snakes, heights, thunder and lightning, flying, water, blood, balloons, enclosed spaces, choking, dental fears, and rats . Imaginal exposure uses the same strategy as exposure in vivo, but treatment is slightly different: in imaginal exposure the patient is not exposed to the real phobic object, animal or situation, but to an imaginal or fake phobic animal, object or situation, for instance an image or through virtual reality ,,,. There are several types of imaginal exposure: Eye Movement Desensitization and Reprocessing (EMDR), Systematic Desensitization, Imaginal exposure, Virtual Reality Therapy, Computer Assisted Exposure, Applied Relaxation, and Applied Tension. Imaginal exposure is effective in the reduction of specific phobia symptoms ,,, and can take away certain phobias, such as fear of spiders  and fear of flying . Exposure in a virtual reality environment seems to be effective in the reduction of specific phobias in children with Autism Spectrum Disorders (ASDs) . More research is needed to confirm the findings in study 4. Some imaginal exposures, such as Systematic Desensitization, Applied Tension, and Applied Relaxation, combine muscle relaxation or tension and imaginal exposure to reduce specific phobia symptoms, but they are not more effective than imaginal exposure without muscle relaxation. Cognitive therapy focuses mainly on cognitive restructuring and guided threat reappraisal. The patients are taught to identify and change their faulty threat appraisals maintaining the phobic reaction. Cognitive therapy is less effective than imaginal exposure or exposure in vivo . Even when cognitive therapy and imaginal exposure are combined, treatment is not more effective than imaginal exposure or exposure in vivo alone . Progressive muscle relaxation (PMR) teaches patients to tense and relax certain muscle groups. Their goal is to teach patients to relax themselves when they are confronted with the phobic animal, object or situation, but they do not use imaginal or real exposure. PMR is less effective than imaginal exposure or exposure in vivo . Benzodiazepines are only justified in case the patient is facing a short-term distress (dental phobia or fear of flying). Benzodiazepines become effective within minutes after oral application  and have a calming effect on people. Escitalopram is not more effective than placebo (placebo is a substance or treatment with no intended therapeutic value) . Wolitzky-Taylor, K. B., Horowitz, J. D., Powers, M. B., & Telch, M. J. (2008). Psychological approaches in the treatment of specific phobias: A meta-analysis. Clinical psychology review, 28, 1021-1037. Ollendick, T. H., Öst, L. G., Reuterskiöld, L., Costa, N., Cederlund, R., Sirbu, C., … & Jarrett, M. A. (2009). One-session treatment of specific phobias in youth: a randomized clinical trial in the United States and Sweden. Journal of consulting and clinical psychology, 77, 504. Vigerland, S., Thulin, U., Ljótsson, B., Svirsky, L., Öst, L. G., Lindefors, N., … & Serlachius, E. (2013). Internet-delivered CBT for children with specific phobia: a pilot study. Cognitive behaviour therapy, 42, 303-314. Maskey, M., Lowry, J., Rodgers, J., McConachie, H., & Parr, J. R. (2014). Reducing specific phobia/fear in young people with autism spectrum disorders (ASDs) through a virtual reality environment intervention. PloS one, 9, e100374. Andersson, G., Waara, J., Jonsson, U., Malmaeus, F., Carlbring, P., & Öst, L. G. (2009). Internet‐based self‐help versus One‐session exposure in the treatment of spider phobia: a randomized controlled trial. Cognitive Behaviour Therapy, 38, 114-120. Triscari, M. T., Faraci, P., Catalisano, D., D’Angelo, V., & Urso, V. (2015). Effectiveness of cognitive behavioral therapy integrated with systematic desensitization, cognitive behavioral therapy combined with eye movement desensitization and reprocessing therapy, and cognitive behavioral therapy combined with virtual reality exposure therapy methods in the treatment of flight anxiety: a randomized trial. Neuropsychiatric disease and treatment, 11, 2591. Wide Boman, U., Carlsson, V., Westin, M., & Hakeberg, M. (2013). Psychological treatment of dental anxiety among adults: a systematic review. European journal of oral sciences, 121(3pt2), 225-234. Bandelow, B., Sher, L., Bunevicius, R., Hollander, E., Kasper, S., Zohar, J., … & WFSBP Task Force on Anxiety Disorders, OCD and PTSD. (2012). Guidelines for the pharmacological treatment of anxiety disorders, obsessive–compulsive disorder and posttraumatic stress disorder in primary care. International journal of psychiatry in clinical practice, 16, 77-84. Alamy, S., Zhang, W., Varia, I., Davidson, J. R., & Connor, K. M. (2008). Escitalopram in specific phobia: results of a placebo-controlled pilot trial. Journal of Psychopharmacology, 22, 157-161.